The project based learning unit only affirms my idea that projects offer many of ideal learning opportunities that teachers hope students create. Through projects, there is an economy of learning that goes on that is hard to match in a more discrete, linear unit-based approach. When constructed well, projects afford students a broad array of knowledge and learning. They are deep into doing something. When that something matters to them those affordances only grow. Projects amplify the notion that learning is complex, messy, and often does not follow a sequential pattern. Consequently, this complex messiness does not easily fit in an environment obsessed with standardization and test metrics. It can work but by no means is hand-in-glove. Of course, being messy, complex, and not sequential in nature is also what makes them so problematic. They violate traditional norms of schooling that continue to generate a lot of inertia. Of course, it is not at all that black and white.Clever teachers have been devising creative projects as a context for deep, dynamic learning for years. So projects have been around nearly forever and, in this way, project based learning has a rich tradition all its own, existing long before the trendy label. However, pairing student agency with project based learning in this unit cleverly connected two elements that go a long way toward creating an environment where genuine learning can happen. Yet, the very nature of that environment belies efforts toward standardization and the like. For the student to truly possess freedom, they must have the opportunity to explore, experiment, fail, and repeat. Too often that opportunity is cut short in an environment that values test scores and easy accountability over other indicators of learning. Outcomes that can be gleaned from projects tends to be more qualitative and often considered, sadly, too soft in comparison to the normed, standardization of International Baccalaureate or Advanced Placement efforts. Again, the two are not premade for a good fit. Yet, if teachers are to create environments for students to be faced with exercising their own agency, there are few opportunities that can deliver so fully as project based learning or one of its many derivatives. I hope that in a year’s time student agency grows considerably. Everyone learns by doing and it is in the doing that student agency can be released and exercised. By creating environments that encourage choice, narration of the work, and reflection, student agency can be strengthened considerably. In line with this thinking, I especially like the idea of providing a loose collection of options that can demonstrate learning and allow students to choose which ones would best suit them, even opening the possibility for something altogether original. This would provide some structural supports without limiting outlying possibilities. The options might be a collection of learning tasks connected to a broader concept that might involve a project or larger product. Or maybe they are just a series of tasks that students can demonstrate their learning in a portfolio-like way. These tasks would be best if they were preparatory and included a spectrum of difficulty. 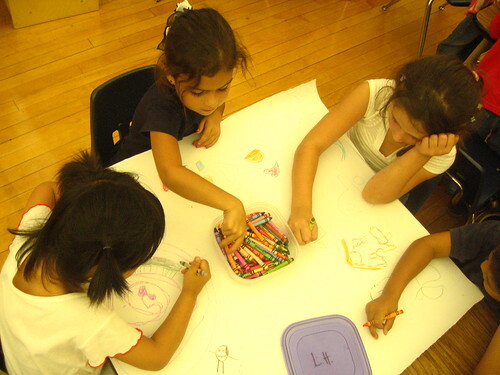 In this way, they could build or lead to a project or larger product if the student desired. I also really like the idea of ranking learning tasks in terms of difficulty, especially with students crowdsourcing the rankings. A lot of my thinking on these topics has been deeply informed by DS106. To me, it remains a shining example of how to construct a framework that does many of these things so well. From using things like the methodology to The Daily Create, Assignment Bank, and star difficulty rankings for individual assignments they have managed to build something where choice and agency is baked into the nature of the course. I would love to implement a system that worked in a similar fashion, especially the star system, with the possibility of it facilitating a better, more organic self-directed project design. There are so many smaller tasks that are critical to research, project management, or engaging in deeper learning that give students a genuine reason to feel pride in what they have achieved. This goes for the work that I do with both students and teachers. This entry was posted in Teaching & Learning and tagged agency, DS106, EdTechTeam, EdTechTeam Teacher Leader Cohort, PBL, project based learning, student agency, Teacher Leader Certificate on March 28, 2016 by Fred Haas - @akh003. 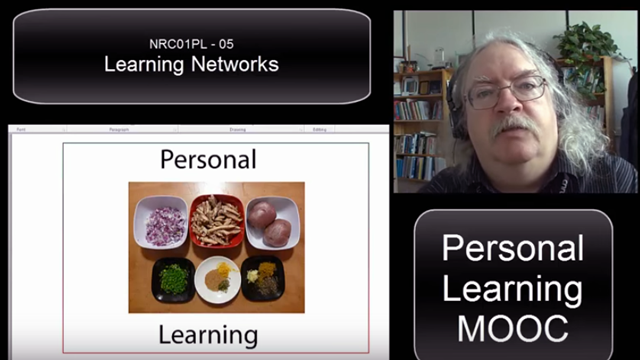 Stephen Downes revisits his 2004 presentation Learning Networks. First, I do not work at a university but at a secondary school. In fact, my time as a full-time educator began in 2004 around the time of Stephen Downes’ presented this originally. The challenges are admittedly different, but not entirely. Here are some thoughts in reaction mixed with my experiences. In reviewing Stephen Downes’ text and re-presentation of the Buntine Oration: Learning Networks, delivered in 2004, I was fascinated by not only how prescient it seemed but how much I agree with him on just how little has changed. It was strange to simultaneously hear and read the words, “I wasn’t so much speaking as listening, not so much showing as searching. I am a student of learning technology, but learning technology is for me becoming increasingly empty,” because they contain so much resonance. I must admit to pangs of eerily similar feelings at various times since first becoming involved in the field. While I generally resist that feeling as much as possible, the strength to do so is primarily rooted in the kind of thinking that Downes and others like him share and champion. It is possible to reject the prevailing attitudes and efforts in favor of more organic options, like the ethos of connectivist MOOCs and the similarly inclined. Fortunately, I believe there will always be an impulse to “rage against the dying of the light.” That keeps me hopeful that there is room for positive change. Interestingly, the landscape that characterized the demise of “learning objects” in 2004 seems to be perpetually replayed. One could easily substitute “learning objects” with open education resources, which might not be a complete like for like, but remain more alike than not. OERs had almost fallen a bit out of fashion in the last couple of years but they are experiencing a resurgence with multiple entities vying to be the Google of OERs, from non-profits to the latest news about Amazon. Meanwhile, learning management systems (LMS) have become even more entrenched in the education landscape. This is becoming increasingly true at the secondary level too. I have written it before but it bears repeating. An LMS is not so much about learning or even content as it is about management. If there is any doubt about this claim, one need only look at the recent emphasis on their improved analytics capability. That is the latest competitive advantage being marketed as yet another reason why they are superior and must be used. Yet the consequences of the notion that an LMS is a requirement for online learning has had even more obsequious consequences. Downes alluded to this when he discusses learning design. An LMS, by nature, privileges certain kinds of pedagogical approaches, in some ways heavily influencing how a course is meant to work. What’s more, as the concept of blended learning has grown so too has the influence of the pedagogical shift conditioned by the LMS. Certain procedural ways of operating are baked into many an LMS. Often the results are more structure, more pre-made curriculum, or more prescriptive efforts, depending on the context. Yet these results extend beyond only content packaging, as well. Again, the LMS benefits administrative and management tasks over learning ones. The nature of how a teacher must interact with most LMS options imposes its own baked-in structures, not to mention the most easily available forms of assessment. It can easily begin to dictate terms to an instructor and begin transforming a class before it may be completely obvious. I would also submit that very little of this transformation benefits the student but rather advances administrative controls. Downes highlighted this fact when he revealed the administrative dashboard of the Open EdX platform and referenced it again in this presentation. I agree with Downes’ assessment of learning design but think that it might even be conservative given how things have evolved. Learning design is not only a dead end, it also imposes its own kind of hegemony. It plays the single solution fantasy that if there was just one place where everything could be presented and controlled it would be easier for the student. Yet, when has there ever been a single source for learning? Even under the traditional model of a single teacher guide in a course, a student’s learning has never been contained within a physical classroom. Why should an online course seek that kind of solution? However, it is the sentiments in the Coda section of Downes piece where I find myself the most aligned. I would argue that the rise of the LMS has cast a long pall across the education landscape.It may have begun at the university level but it certainly is growing at the secondary level. Since they all are essentially walled gardens or silos, they inhibit the growth and development of online learning as a new and different environment, as well as practice. There may be specific times where this is warranted, but I question just how often. Plus, it need not be the default. Teachers that find a way to succeed in spite of the limitations are locked away from public view. Exemplar models of online teaching practice or individual teachers remain simply unavailable to outsiders. This is part of what makes cMOOCs so fascinating. The gears are so often exposed for anyone to see. One of my favorite examples of the open and transparent approach is DS106. It is truly the MOOC that became a community. It continues to run as a face-to-face offering on the campus of University of Mary Washington and elsewhere and commands a significant following long after each individual iteration. DS106 is a model of how to leverage blogs, RSS, and more while creating a learning environment that is open, inviting, and freely available. DS106’s ethos of “narrating the work” is deeply embedded in nearly every task. Plus, people are doing things all over the place. What’s more, the community that has grown up around DS106 embraces that ethos and the leaders have been exceptional about drawing back the curtain to show how it all works. It is a course but need not be approached as one with a variety of tasks that can be sampled a la cart. Learning tasks are crowdsourced, with students able to both contribute assignments and rank them in terms of difficulty. And all of this and more is accomplished completely without an LMS. This entry was posted in Learning, Teaching & Learning and tagged cMOOC, DS106, Learning Management Systems, Learning Networks, learning objects, LMS, MOOCs, NRC01PL, OER, Open Education Resources, Stephen Downes on March 6, 2016 by Fred Haas - @akh003.